And wondered about each so still, their badges all on show. Was like for each of them? These soldiers, boys and men. And will be, now and ever. Of how they came to soldiering, what part each one had played? They guard this hallowed place. Some personal "today in history" experiences, very good LeEnfield! In what became known as St. Clair's Defeat, U.S. General Arthur St. Clair was beaten by the British-supported Northwest Indian Confederation. The hostage crisis in Iran began as the U.S. embassy in Tehran was seized by Iranian militants in a move sanctioned by Ayatollah Ruhollah Khomeini. Israeli Prime Minister Yitzhak Rabin, corecipient with Shimon Peres and Yasir 'Arafat of the Nobel Prize for Peace in 1994, was assassinated this day in 1995 by a Jewish extremist while attending a peace rally. It quickly became apparent to the rank and file that no one was sure just what we should be doing. We were moved some distance along the beach to some beach huts where we made our base camp. Now these beach huts must have been grand places in their time and built for the Victorians and Edwardians to escape the worst of the Egyptian heat, there were lavish bedrooms, kitchens and dining rooms, and you could still see the faded glory from those days lingering in the buildings. Well during the day we did some patrol work which I wont go in to on this story, but come the evening we went to settle down in the beach huts, but gave that up as a bad job as the thin planks of wood were letting bullets in like you would not believe and for safety sake we abandoned them for the sake of a slit trench. 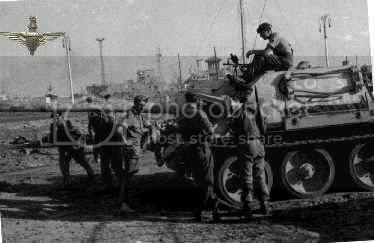 Well about 22.00 hours some lorries were passing through our lines when a 105 mm shell hit one of them. 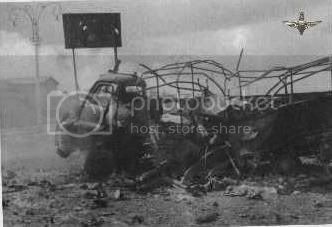 The lorry a brand new Bedford did not explode but caught on fire. The driver who was fairly a very young national serviceman was terrified of getting into trouble and was try putting out the fire with a hand pump Pyreen fire extinguisher, and was standing amongst the flames pumping away why we stood around the lorry cheering him on. After a few minutes the flames were spreading fast and some bright spark asked the chap what he had on the lorry, the driver proudly announced that he was carrying ammunition. Well we pulled the driver of the back of the lorry and headed for the slit trenches and no sooner had we arrived the whole lot went up. Well emerged some minutes later rather sheepishly and relieved once a head count had been done that we were all in one piece. 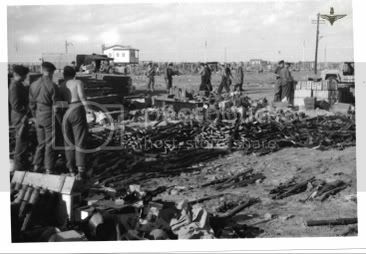 Now we had another problem the ammunition had set fire to a couple of the beach huts and the whole area was lit like day and the Egyptians shells started popping of at fairly regular intervals as we were such a good target. Our officer thought we should put out the fires, which we agreed, the question was how. The sea was near by but we nothing to carry that amount of water in so, some bright spark suggested that if we got a number of us standing around one of the burning buildings and if we all had a hand grenade and on the count of three we would all pull the pins out at same time and throw them in to the building it might just bring it down then we could shovel sand on it and put the fire out. Well he thought about for a minute then agreed. Well dozens of grinning Para’s arrived with their grenades and on the count of three, a dozens were thrown at the building. There was a clatter glass as some went in, but there was some loud thumps as some of them hit the building or wood work and came bouncing back, when I looked at my feet there was a smoking grenade. Well we took of for trenches again but this time we made for the closest one. Those that got there first were squashed by the late comers who dived in on top of them, those that got there last dived for the trench and found that they were a couple of feet in the air as the trenches were that full. Well after a number bangs we got up and checked and again we had all survived. 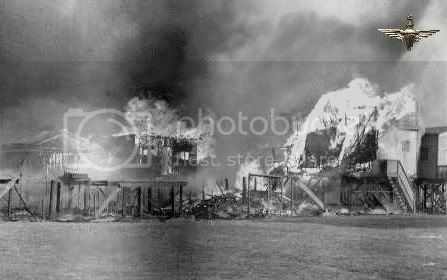 The beach huts were still standing but with some big holes in them that allowed the air to get in and the fires to burn brighter than ever. The officer went of muttering that we were all trying to kill him one way or another and if he could remember who suggested such a daft thing he would shoot the silly sod. So that night we slept in the trenches safe, sound and very warm. 1940 On this day in 1940, Franklin Delano Roosevelt is re-elected for an unprecedented third term as president of the United States. Roosevelt was elected to a third term with the promise of maintaining American neutrality as far as foreign wars were concerned: "Let no man or woman thoughtlessly or falsely talk of American people sending its armies to European fields". Thank you very much for your story LeEnfield. France and Britain declared war on Turkey, widening the conflict of World War I.